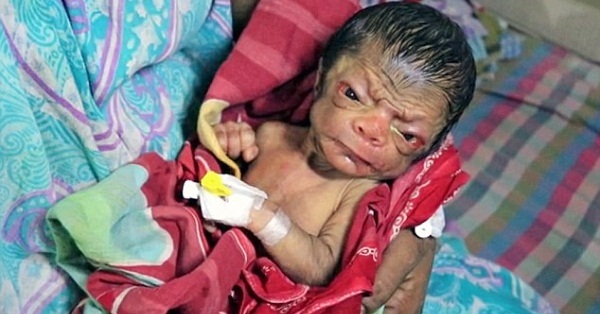 “Baby Boy Patro” from Bangladesh, was born with Progeria, an extremely rare genetic condition. Also popularly known as Benjamin Button Disease, the baby was born with an appearance of an eighty-year-old man. His face with wrinkles, old eyes, and sagging skin. Asides from these physically obvious features, babies born with the disease may also suffer other old age symptoms like the stiffness of joints, hip dislocation and atherosclerosis (cardio and heart disease). This disease affects one in four million babies and may affect both boys and girls and regardless of race or ethnicity. The movie Benjamin Button starring Brad Pitt was based on the story of another child born with the same disease. Hence the name of Benjamin Button Disease. But unlike Benjamin Button who was unaccepted by his real parents, Baby Boy Patro is very lucky that his parents saw him as a blessing. Parents Biswajit and Parul is not a bit bothered by the appearance of their son and is thankful and happy to have their newborn son as addition to their family now of four.